In a few regions of New Zealand we are about to embark on increased harvest activity. But in the East Coast, parts of Northland and to a lesser extent some other regions the local roads are not up to carrying the increased volumes. The main issues are sight lines for safety, pavement strength, pull-over bays for passing and occasional cases of dust nuisance for residents. The local roading authorities in those regions are aware of the issues, and have been struggling for years to fund maintenance and upgrades. But the local share of funding that is not met by NZTA is from property rates. When there is extensive hill country pastoral farming and forestry as the main rural land use and low population regional towns with many other demands on the rates, the sums simply don’t work. Raising of rates to meet the funding shortfall is problematic. 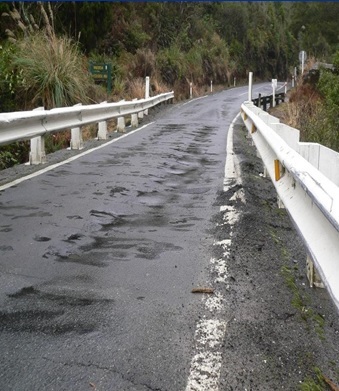 The ratepayers of Gisborne, Wairoa, Kaitaia or Dargaville for example would show some aversion to big rates increases to fund rural roads in their district. Gradual loss of the roading capital base from lack of on-going maintenance. The necessary upgrades get costlier over time. Trucks having to take longer routes to mill or port to avoid unsuitable roads. High truck maintenance costs and per km freight rates. Some forests suffering delays to commencement of harvest. This is a lost regional employment and economic opportunity. Forest owners reverting to upgrading sections of public roads themselves, but in an uncoordinated manner, to variable standards and with unfair sharing of costs and benefits across all heavy truck users of those road sections. The scale of the problem, while large for the worst affected regions, is relatively small in the context of the national roading budget. A 2016 study by Opus estimated a requirement of about $60 million to bring all the Gisborne District local roads up to a standard suitable to cope with the increased log truck traffic. If we multiply that up to deal with Wairoa, Northland and a few rural roads in other regions we might expect a demand of say $150 - $200 million to be spent nationally over the next 4 years in the worst affected regions. Compare that to the budget of $9.17 billion to be spent on state highways over the next 4 years or the $1 billion to reinstate the highway between Picton and Christchurch. While the wisdom of upgrading, or building roads of national significance is not under question, the payback on maintaining and upgrading selected rural roads is also high. For example, a simple calculation I did on a $550,000 upgrade to a 12km ridge section of the Waimata – Hokoroa Road would have a roughly 20:1 payback on reduced travel distance and resulting freight rates alone. This ignores the positive impacts of taking log trucks off the higher maintenance alternative route and SH35 from Tolaga Bay to Gisborne. Increased heavy traffic generates RUCs that can be applied to road construction and maintenance but there is a timing mismatch. We need the roads before the RUCs are paid. So, what is the solution? Firstly there is clearly a regional economic and employment case for these rural roads to receive greater NZTA funding support where the population and rating base is so tiny relative to surrounding rural roading network. The funding model needs revisiting. Secondly there needs to be a mechanism whereby affected forest owners can, as consortiums or individually, fund the local share of a road upgrade by way of a loan to the local roading authority, to be paid back over a few years in cash or by way of rates relief on those properties. But this work needs to be done in a coordinated way to agreed standards. Fit for purpose rural roading should not be a political, sectoral nor an urban/rural issue to scrap over. It is fundamental to the safety of all rural road users and to efficiently generate wealth from by far our single largest economic driver of these affected regions – growing produce from our land and selling it profitably to the world.